Syn Free Slimming World Lamb Rogan Josh Curry cooked slow in the slow cooker. If you want to enjoy a delicious curry in the slow cooker, then give lamb rogan josh a try. If you’ve been following my Slimming World Curry recipes, then you will know that I love curry and then I have featured several of them on recipethis.com. They have ALL been cooked in the slow cooker and taste amazing, without you having to slave away in the kitchen for hours and hours. Slimming World Chicken Curry – A basic chicken curry that is easy to change based on the strength of the curry that you want. You could also swap the chicken for prawns or pork. Slimming World Butter Chicken – Totally SYN FREE and OMG its so good. It has been shared more than 100,000 times from our readers and our readers love it as much as us. Slimming World Speed Food Curry – A Slimming World curry that is loaded with Slimming World Speed Foods. Its perfect for if you want a QUICK weight loss. Slimming World Chicken Balti – A curry in a hurry that is a case of just dumping a few simple ingredients into the slow cooker and then letting the slow cooker do the hard work. Slimming World Chicken Korma – The nations favourite all thrown in and dumped in the slow cooker. Serve this up with some fluffy slow cooker rice. And now today is the turn of a delicious Slimming World Lamb Rogan Josh. I once worked in an Indian takeaway and it wasn’t until then that I realised just how popular the lamb rogan josh was. Whenever I was out for a curry with friends and family, it was always the same items that was ordered from the menu. A bhuna, masala, korma and of course the legendry butter chicken, but I never recall anyone when we ate out having a rogan josh. Yet working at the takeaway the rogan josh was incredibly popular especially among the weight conscious women. I had never tried it and once asked the owner about it and he served me one up there and then. It was delicious and what I loved most was the yummy peppery taste from the red peppers. He told me it was the diet curry and that his family ate it at home a lot. He also said that it was taking off in Britain, but it would never be as popular as his butter chicken and chicken korma that ruled. 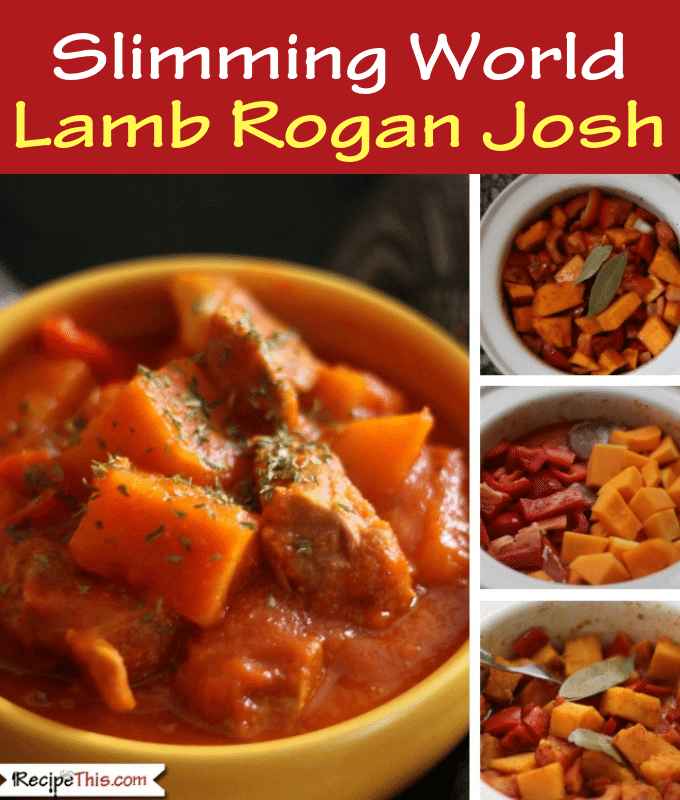 So, if you’re watching your weight and want a curry then give lamb rogan josh a go! The second involves a lot less ingredients as you are replacing many of them with a madras paste instead. Its up to you how you do it, though I prefer the first option without the madras paste. Peel the butternut squash and remove the seeds. Deseed the pepper and slice into strips. Peel and thinly dice the onion, garlic and fresh ginger. Place the curry base ingredients and the seasonings into the slow cooker. Cook on high for 2 hours or until the vegetables are soft. Using a hand blender, blend the contents of the slow cooker until smooth. Add your extra lot of vegetables along with the lamb and place in the slow cooker rogan josh sauce. Cook on high for a further 5 hours or until the lamb is tender. To keep it syn free make sure you trim in excess fat off the lamb. If you want a creamier taste then add a little Greek Yoghurt, Quark or coconut milk at the end, depending what your favourite creamer is. This lamb rogan josh is perfect for batch freezing. Double up the recipe, or triple it and then heat up the rest later.